Maritime Ships Database is a ship database covering engine driven ships since the invention of steam engines. Added to present coverage of present world fleet details as well as ships on order, Maritime Ships Database is adding ships of the past for the purpose of complete coverage of analyses of ships and their players over the past 150 years. 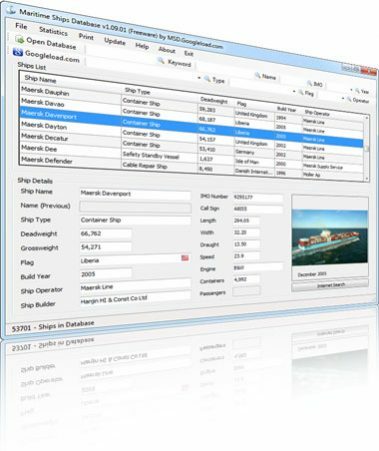 Covering more than 57 000 ships and offshore rigs as well as ships on order, Maritime Ships Database is offering its customers a unique tool for fast access to market segments by professional used ship types. An open offered mathematical model is offering the user a theoretical way of measuring ship values linked to market activity at any time. This is making it possible to measure fleet values of any size from owner fleets to national fleets by ethnical origin or address. However, if information has not been made available to MSD, then the relevant field and corresponding heading does not appear.